This review is completely and utterly insane. If you read it, then describe it using such words as preposterous, impossible, improbable, hogswallop, or the ever-popular bullship, I won’t disagree. I did all the work here, and I still think it’s the goofiest thing I’ve ever experienced in audio since I got seriously involved in the field 40 years ago. It should be impossible. I was trained as and worked as an engineer -- mechanical, electrical (including power-supply compliance), software, and computer systems -- for more than 35 years, but this goes against everything I know or thought I knew about electricity, electronics, and physics. Had these results been written by anyone else, I’d have described them as complete fantasy. Perhaps most interesting of all, what I talk about in this review might be only the iceberg tip of something I don’t recall having once read about in the last four decades. 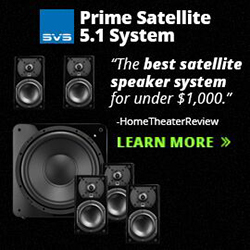 This review is about computer audio. But even if you aren’t doing computer audio -- or if you are, but not via FireWire 800 -- some of what I say here might apply elsewhere in your system. PC users may think they have no use for a FireWire connection, but that’s not true. Many PC desktop and laptop models have IEEE-1394 interfaces, aka FireWire. The “800” in FireWire 800 refers to the protocol’s data-transfer rate of almost 800Mbps, but with some interfaces FireWire 800 can support up to 3200Mbps. The earlier version, typically referred to as FireWire 400 or merely FireWire, is about half as fast. FireWire 400 cables have connectors with six pins, FireWire 800 cables nine pins. They’re cross-compatible, but you need a converter cable with six pins at one end and nine pins at the other. Here’s the insanity. A cable that wasn’t being actively used as I listened changed the sound of the music I played. That seems so completely wrong that it must be insane. A cable that’s doing nothing while the music is playing affects the sound quality? Impossible. I use an Intel Macintosh Mini computer (aluminum unibody version, ca November 2010) because I can’t make a Windows PC sound as good, no matter what tricks I try or playback software I use. I replaced the Mac Mini’s stock hard drive with a solid-state drive and increased its RAM to 8GB. The operating system is Mac OS 10.6.7, aka Snow Leopard. My library hard drive is in a FireWire 800 enclosure, which means it’s not on a USB bus with the USB DAC. I’ve carefully chosen the USB connections for the DAC and USB extender/hub (keyboard and mouse) so that the two devices do not share a USB bus. Simply using two different USB connections does not necessarily mean that you’re on two different USB buses. I’ve disabled the Mini’s Bluetooth and Wi-Fi, but it does have an Ethernet connection, which I primarily use to control the Mac from an iPad via my network. I use the Mini only for music playback -- no applications are installed other than the latest versions of the Amarra and Decibel playback softwares, and what comes standard with OS 10.6.7. The Mac Mini and the external hard drive’s power supply are plugged into a dedicated passive power conditioner, which gets its power from an active ExactPower EP15A, which also powers the rest of the system. Amarra and Decibel are set up to play music from memory, not directly from the hard drive. Having the solid-state hard drive dramatically speeds up the process of loading tracks into memory. Remember, that library hard disk transfers all of the data comprising each music file via the FireWire 800 interface before music playback begins. When the music is playing, the hard disk and the FireWire 800 cable are doing nothing except perhaps loading tracks farther down the playlist. What possible mechanism could allow a cable that’s not even involved in music playback to make the differences in sound described below? I have no idea, and I won’t speculate. I was so flummoxed by my initial results that I wrapped each FireWire 800 cable -- generic, AudioQuest Diamond, and AudioQuest Carbon -- in shrink tubing (shrunk only at the connector ends), then mixed them up, then wrote on each a symbol (a horizontal, vertical, or diagonal line) so I wouldn’t be influenced to think that, say, a more expensive cable had to sound better than a cheaper cable. Only after I’d finished my listening and removed the shrink tubing did I know which cable was which. As mentioned earlier, the computer system, via the generic FireWire 800 cable that came with the hard disk enclosure, already sounded better than any disc-spinning setup I’ve used over the years. The system sounded so good with this cable I couldn’t think of any possible benefit that might come from replacing it. With the generic FireWire 800 cable, the sound is very involving, very musical, very spacious, and very detailed. The Diamond, AudioQuest’s top-of-the-line FireWire 800 cable, costs $695 USD per 1.5m. It has the same construction as other AudioQuest Diamond cables: Each conductor is a single solid-core wire, not the more common multistranded conductors found in most cables. In the Diamonds, the conductors are 100% solid Perfect-Surface Silver. The connectors on both ends are silver-plated. The Diamonds incorporate AudioQuest’s proprietary Dielectric Bias System (DBS), in which an extra conductor is placed in the center of the cable and connected to a 72V battery pack at one end. The shield around the cable is connected to chassis ground, but also acts as a field element for DBS. A small battery rides piggyback on the cable, one of its terminals connected to the shield and the other connected to the extra wire in the center of the cable. This sets up, between the shield and the center of the cable, a steady-state, 72V DC electrostatic field that bathes the dielectric (i.e., the insulation) and conductors in an electrical field much stronger than that created by the music signal itself. 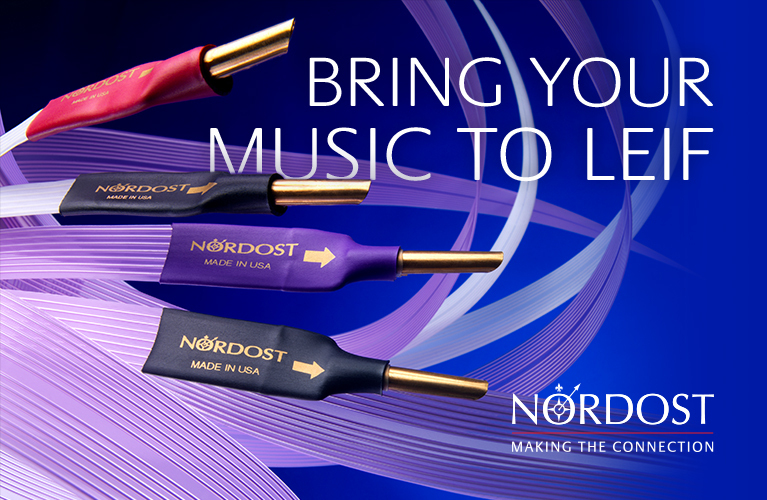 AudioQuest says that this dramatically improves the sound -- and, apparently, the data-transfer performance -- of any cable by fully saturating the dielectric. AudioQuest says that this never happens in nonbiased cables, in which the music signal is so weak that it can’t fully saturate the dielectric. In addition, when you stop playing music, you stop any saturation of the dielectric by the music signal, and eventually, as it sits idle, the dielectric desaturates itself. The 72V bias system keeps the dielectric fully saturated all the time, even when the cable is idle. I was skeptical that a cable that’s doing nothing while it’s being evaluated could affect the sound in any way. But first, here’s what remained the same, no matter which of the three cables -- AudioQuest Diamond, AudioQuest Carbon, or generic -- I was listening to: I heard no difference in tonality, harmonic content, detail, top-to-bottom balance, or soundstage width, depth, or height. I didn’t hear more or less bow sound or body sound. What changed were the apparent amounts of “air” and compression. “Air” is perhaps best described as a clearer, quieter space around each instrument or singer, and even between notes. The generic cable created a sound that seemed compressed by comparison, as if the top 5% of the peak of each note had been shaved off and pushed into the otherwise quiet spaces between that note and the notes before and after it. The generic cable sounded, basically, a little reined-in. Whether I listened in a blind or a sighted test, the Diamond cable beat the generic. The effect was the same with every recording, from the not very good to the best-sounding I have. Standard CD resolution or hi-rez, everything I played sounded better through the Diamond. In the title track of Supertramp’s Even in the Quietest Moments . . . , from the 2002 remastering (16/44.1 FLAC, A&M), a single string of a double bass is plucked. The bassist then slides his finger up the neck to lower the pitch of that string as the vibration dies away. This sound seemed squeezed and homogenized with the generic cable, but ultraclear and present with the Diamond. Each instrumental sound and voice got the same degree of clarification from the Diamond. Everything on such wall-of-sound recordings as “Don’t Answer Me,” from the 2008 remastering of the Alan Parsons Project’s Ammonia Avenue (16/44.1 FLAC, Sony-BMG), received a nice little bit of clarification. Each element of the “wall” was better defined and more solidly placed in the mix. The lead singer’s voice was more distinctly placed front and center in the soundstage, with each element of the wall of sound spread out behind and to the singer’s sides, and with better specificity of placement and more clarity. This made the recording sound bigger and richer, even though individual sounds had no added richness, no extra dose of harmonic content. Simpler mixes, as of “Juke Box Fury,” from the original CD edition of Rickie Lee Jones’s The Magazine (16/44.1 FLAC, Reprise), benefited in similar ways, each element being clarified and delineated with improved precision. In fact, I could understand a bit more of RLJ’s mumbled lyrics when using the AudioQuest Diamond. 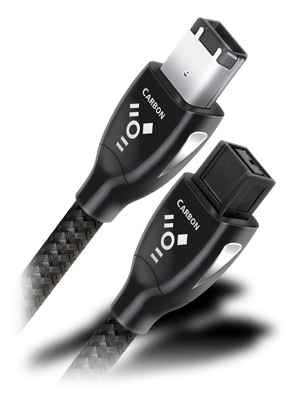 At $159/1.5m, or less than one-fourth the price of the Diamond, the AudioQuest Carbon FireWire 800 cable produced more than half the improvement. 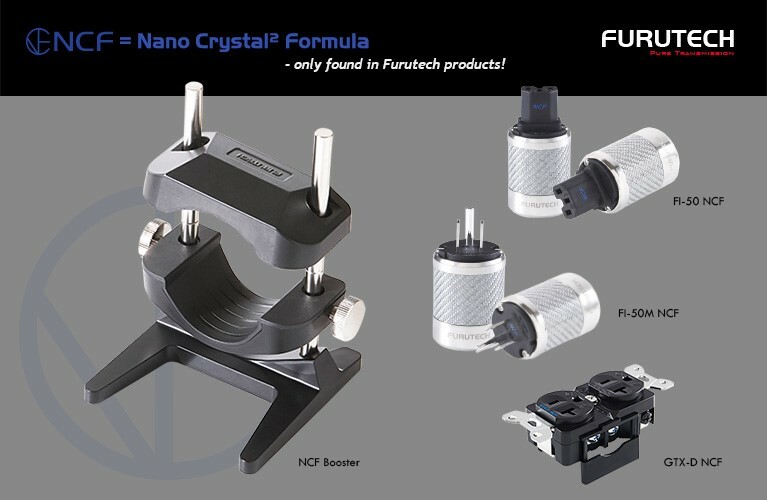 The Carbon’s construction is similar to the Diamond’s, with polished conductor surfaces, but it lacks the battery DBS system, and each conductor is solid, high-purity copper plated with 5% high-purity silver. The Carbon performed exactly like the Diamond, the only difference being the degree of clarification offered. I liked what the Carbon did, but the Diamond was more addictive, albeit at a much higher price. In short, the Diamond gives you twice the Carbon’s sound quality but at four times the price. When it comes to the magnitudes of differences heard, reviewers and readers are often on different wavelengths: Because of how a reviewer has described a difference in sound, a reader may assume that the reviewer has heard a much bigger difference than he or she actually did. I wouldn’t call the difference between the generic FireWire 800 cable and the AudioQuest Diamond huge or large or big or substantial. In fact, it might be missed by those who aren’t focusing on precisely what the Diamond and Carbon are doing. I characterize the difference as being somewhere between subtle and significant, the Carbon favoring the subtle end of that scale, the Diamond the significant end. If you focus on tone and harmonics, or the balance of frequencies from bass through treble, or conversation among the musicians, you’ll hear no difference at all. You have to be paying attention to just the right performance factors, or you may think there’s nothing going on at all. Once I heard what the AudioQuest cables were doing, it became more significant and desirable. 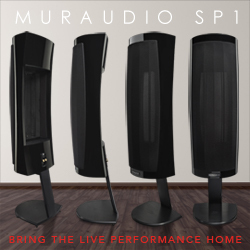 But in audiophile terms, significant is not necessarily synonymous with large. We audiophiles tend to get excited about small differences that incrementally improve our listening experience. Because we tend to have systems that perform at a high level -- say, at 9.3 out of an ideal of 10 -- something that improves that system’s performance to 9.4 or even just 9.35 is worth something to most of us. We feel such improvements are significant only because we know that our systems already sound pretty good, that it’s not easy to get better performance, and that we’ve already done all the easy, affordable things that might better our systems’ sounds. I definitely put both AudioQuest cables in the category of providing small, incremental improvements. What if other “unused” or idle cables in your system also affect its sound? You may find that upgrading these cables might improve the sound of your system, even if those cables aren’t actively involved in playing the music. Maybe the crappy cable-TV box you hooked up with generic interconnects is dragging down the sound of your system. What if your Ethernet cable is making your computer playback sound worse -- even if the music signal isn’t routed via Ethernet at all? AudioQuest makes Ethernet cables, and just about every other type of cable you might be using in your system. The amount of experimentation you could get into is fairly serious, without even considering some other brand. But that’s all I can deal with for now. My head hurts just thinking about it. The playback software of my system loads tracks into memory and then plays those files from that memory, which means that, once the data have been transferred, the library hard drive shouldn’t even need to be connected to the computer, right? So what is the sound of no cable at all? I tried this with Decibel 1.2.5. I loaded a 25-track playlist and tried playing it, with and without the Diamond FireWire 800 cable being connected. Decibel would play only the first two tracks before producing an I/O error, but that was good enough for this evaluation. I loaded the playlist, listened to the first two tracks, then ejected the external hard disk (using a Mac function equivalent to Windows’ “Safely Remove Hardware and Eject Media”), disconnected the Diamond cable, and listened to the two tracks. I repeated this several times, rebooting the Mac each time after reconnecting the FireWire 800 cable. With no cable, the sound was thinner, with leaner bass, but there was a more depth-y character to the sound. With the Diamond cable, the sound was a little richer and fuller in the bass, and the bass and lower midrange were better integrated with the rest of the sound. Again, not a huge difference, and other aspects of the sound didn’t change at all. You’d think no cable at all would produce the best possible sound, but in this case that seems not to have been true. I actually preferred the sonic balance with the Diamond cable hooked up. A cable doing nothing sounds better than no cable at all? Insane. My feelings about this review are manic. One minute, I can’t wait to have the review done and sent; the next, I can’t bring myself to click Send to submit it. In the end, I have to call it as I heard it. I did my best to eliminate biases, and listened many times over a few months. While the degree of sonic improvement wasn’t large in absolute terms, it was just the sort of improvement that keeps audiophiles on the upgrade path. Kudos to the AudioQuest Carbon cable for bang-for-buck performance, and to AQ’s Diamond cable for cost-no-object performance. Price: $695 USD per 1.5m. Price: $159 USD per 1.5m.